This detailed map covers Wymering and the western half of Cosham. Coverage stretches from Portsmouth Racecourse (later to become part of Paulsgrove) eastward to Salisbury Road in Cosham. Features include part of Portsmouth racecourse, Wymering Manor, South and East Wymering Farms, Wymering church, Wymering Garden City with several newly built streets, railway with Cosham station, Portsmouth tramways, Portsdown & Horndean Light Railway, Queen Alexandra Hospital, Training Centre for the Blind, Children's Homes, central Cosham including High Street, cattle market, cinema, Cosham Park House, etc. 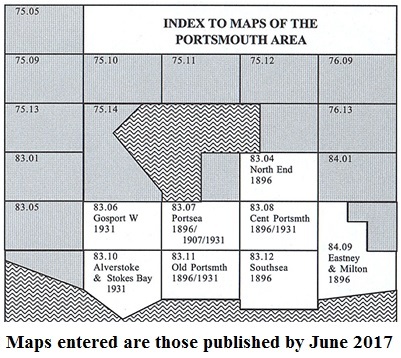 In 1920 Portsmouth's boundaries were extended onto the mainland to include Cosham and Wymering, and provide much needed land for housing to relieve Portsea's appalling slums. Almost immediately work started on a new housing estate, known as Wymering Garden City; after the 2nd World War there would be the development of Paulsgrove next door. Until that time Cosham had been a small but busy village in Wymering parish, famous for its many pubs on what was then the only approach road to Portsmouth. The parish church was at Wymering, and in the 1860s had become the first church in the diocese of Winchester to have the vestments and high ritual of Anglo-Catholicism, with the vicarage even playing host to a community of nuns. This all ended in tears, but in the 20th century the parish would see its population grow massively from 2,371 to 30,688, while trams run by Portsmouth Corporation and the Portsdown & Horndean Light Railway would serve Cosham. Many of these developments are shown and discussed on our map. "Horse and pony racing continued until 1939 and the outbreak of war, when the racecourse was closed, together with the railway station, though the latter was not formally abandoned until the 1950s. After the war there was a desperate need for land for emergency housing for those made homeless by Portsmouth’s wartime devastation. Land was immediately acquired at Paulsgrove and building commenced in 1945, at first with prefabs but later with more traditional houses. Early construction work on the new roads, including Allaway Avenue (named after a Mayor of Portsmouth) which would run through the centre, was partly done by Italian POWs, who were billeted in hutments near to Queen Alexandra Hospital. Paulsgrove quickly became a major suburb of Portsmouth, with a population in 2011 of almost 15,000, making it seem extraordinary that the station has never been reopened." Follow this link for a complete list for Portsmouth maps, or follow these links for the rest of Hampshire, or Isle of Wight.